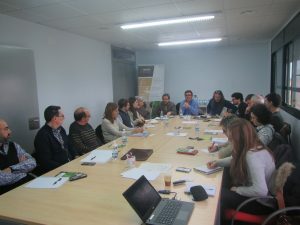 On 2nd February 2018 IRTA and UB organized a conference to discuss the Apple Snail situation in Ebro Delta rice fields and the techniques to fight it. The meeting took place in IRTA premises in Amposta. There where 21 atendees including researchers from UB and IRTA, technicians from farming companies, and deputies from the Catalan Government. The first day of the seminar there where presentations of the results of the treatments using seawater and bipoesticides. The second day there was a presentation on dry seeding and the work performed by Neurice project on new saltol rice lines. There was a discussion about the expected impact of the Neurice project in rice production in Europe.